Today is the first day of the Caardvark's Sketchfest event. It's been a CRAZY crazy day around here. I'm just getting around to talking a picture of this card and even that task was a HUGE ordeal. So, I had to take this with flash. I'm gonna re-do it tomorrow. I used the first sketchfest sketch and the color and embellishment challenge over at Embellish Magazine. The main image is Softpencil. It's the Loving Birds digi stamp. 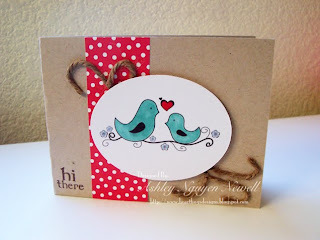 The sentiment is Unity Stamp Co, from the old Mix Up of Cuteness set. I'm not sure what's in the set now. Sweet card. Love the birds. Love the texture of the twine ... very fun sketch design. Cute card. I just love the birds and the texture the twine makes. this is wonderful! those sweet birds are fabulous...what a very pretty card! Those birdies are so cute!! I also love that you used the same color scheme in this card and the one above it!!! My SU! upline always told us if you get the stuff out to make one card you should always make 2 because you have all the paper out or make 4 if you have two sheets of paper out!!! If I did that every time I would have a lot of cards to RAK!!!! WOW, I am way behind on my commenting or you've been a busy lady... or both! I love this! I just love that red, blue and kraft combo... I need to try that! Love this card! The birds are adorable!